On Sunday night, the pros who replaced veteran standouts meet when Tom Brady leads the New England Patriots against Colin Kaepernick and the San Francisco 49ers. FOXBOROUGH, Mass. (AP) — The veteran quarterback ran up the sideline back in his own territory, took a hard shot from the linebacker and went down. He stayed in the game but couldn’t finish it and lost his starting job. The career of the player born in Washington state and chosen with the top pick in the NFL draft would never be the same. By the time Bledsoe, the top pick in 1993, recovered from a sheared blood vessel in his chest in 2001, Brady was entrenched at quarterback. Now, 11 years later, Brady says he didn’t feel awkward despite Bledsoe’s disappointment at losing his job after being injured. That’s where Smith, the No. 1 draft choice in 2005, suffered a concussion on Dec. 2 in a collision with Jo-Lonn Dunbar of the St. Louis Rams near the left sideline on a 4-yard run to the 49ers 26-yard line. He kept playing, completing his final five passes on the series. He finished it off with a 14-yard scoring throw to Michael Crabtree early in the second quarter. Kaepernick replaced Smith for the next series and he hasn’t played since. Bledsoe’s injury came in the second game of the 2001 season on an 8-yard run when he was hit in the fourth quarter at the right sideline by Mo Lewis of the New York Jets. He stayed in the game until being replaced by Brady for the final series. The young backup completed four of five passes to the Jets’ 29 but threw incompletions on the final four plays of the Jets’ 10-3 win. So what’s it like for the young guy to replace the old guy? “Am I an old guy or a young guy now?” Brady said with a smile. He’s 35 now with three NFL championships, two Super Bowl MVP awards and two league MVP awards. When he took over, he was 24 and Bledsoe was 29 with three Pro Bowl appearances. 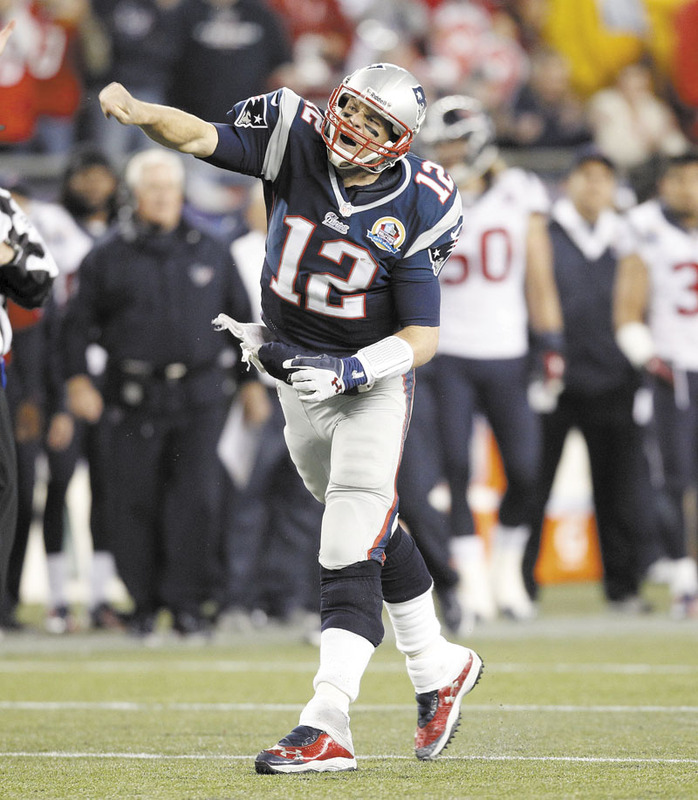 “As a player, you just try to focus on what you have to do to help the team win,” Brady said. “When you’re not playing, you support the guys that are playing. You help out in practice and then when you get your opportunity, you try to go in there and support the team by playing. Bledsoe was cleared for the 10th game in 2001 and was the No. 2 quarterback but didn’t play in it. His next chance came when Brady hurt his left ankle in the second quarter of the AFC championship game. In his first game in more than four months, Bledsoe threw an 11-yard touchdown pass for a 14-3 halftime lead, then led a field-goal drive and helped take time off the clock with clutch third-down completions. The Patriots beat the Pittsburgh Steelers, 24-17. “I compare it to giving a starving man a little taste,” he said then. But four days before the Super Bowl, coach Bill Belichick announced that Brady would start. And the sixth-round pick delivered, throwing for 145 yards and one touchdown as the Patriots secured the first of their championships with a 20-17 upset of St. Louis. Now, San Francisco coach Jim Harbaugh has chosen Kaepernick over Smith to lead the offense down the stretch. At 9-3-1, a win Sunday would clinch the NFC West title if the Seattle Seahawks lose. The 49ers would still clinch a playoff spot if both win. Smith and Bledsoe were upset to lose their jobs after being hurt. But Brady had gone 13-3 in his starts, so he got the call and the Patriots won the championship. Now Kaepernick is 3-1 as a starter. And that’s what counts, not the feelings of the quarterbacks. So the considerations in deciding who should play — the recovered veteran or the promising second-year pro — are simple. “To win. There are no other considerations,” Belichick said. “That’s the only thing we’re really here for is to win. What else is there? I don’t know.